It was time to say good bye to the Kaohsiung city and continue our journey for visiting the oldest city Tainan. It was about an hour drive from Kaohsiung to Tainan. We dropped off our friends Kent and his girl friend at the high speed train station in Zuoying on the way to Tainan because his right knee was getting worse. It was not easy to say goodbye to good companies, but we had no choice over his situation. At least, I knew Kent and his girlfriend enjoyed this trip untill now. We stopped at this beach in the outskirt of Tainan. There was an American beach nearby; however, it was gone due to the city development. 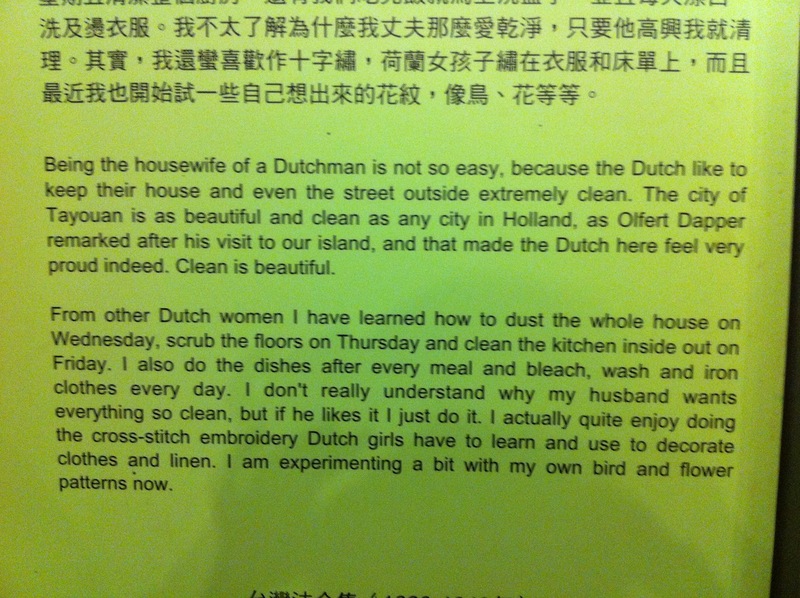 My husband asked a lot of local people about the exact location, but no one could give a correct answer. 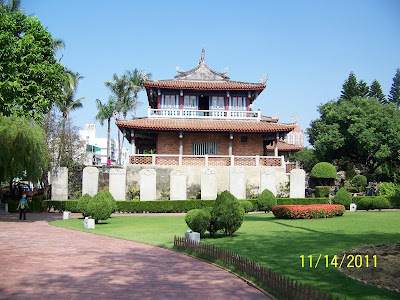 We stood here listening to my husband talked about the history of American military stationed in Tainan. This was a tourist service center. It was built by a former city mayor who was in jail, because the mayor didn't apply for a permit to build it. So, it would be taken down soon because of the legal issue. That was surpriseing news to me. 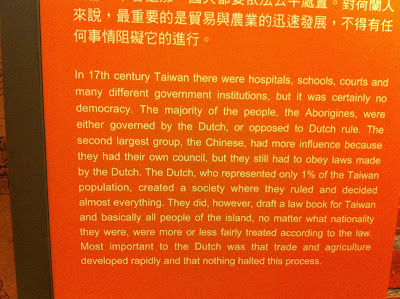 In 1624, Holland people came to Tainan. 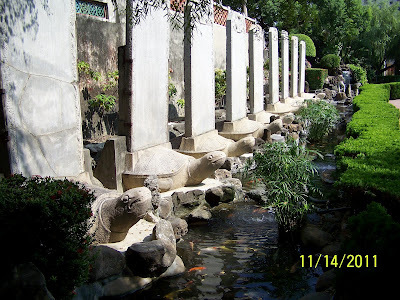 They used Tainan as their trading center going to China, Japan, and South Asia countries. They also recruited labors from China. But their abusiveness triggered those Chinese labors to fight with them in 1652. Although this incidence was settled, they started to build Fort Provintia to protect themselves and isolate those Chinese labors. The tower is located near the center of the downtown area. It is a small area but is kept up nicely. This sculpture portraits Koxinga and a Dutch man signing a treaty. Originally, the Dutch man was sculptured as he kneed down to Koxinga. After the Holland Ambassador's complaint for not showing the truth and degrading their people, the city government had the sculptor redone. 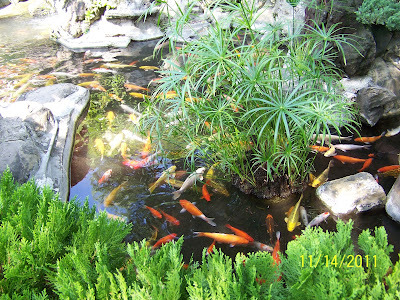 There is a pond inside the court yard with a lot of beautiful carps. Was it the Japanese influence? There are 9 steles for commemorating a great general who came to Taiwan to defeat a civil war in 1788. If you visit a temple or a historical site, you will see a lot of steles siting on a turtle-like animal. According to the Chinese mythology, the turtle-like animal was the first son of the dragon which has 9 sons. In Chinese legend it carried mountains and other things into rivers to destroy crops and things. God punished it to carry the heavy stuffs which could slow down its action. Therefore, it was used to carry steles in temples. What are the differences between a turtle and it? It has teeth and a turtle doesn't have teeth. Also their shells are different in shape and pattern. The turtle-like animal represent long-life and good luck. Next time when you visit a temple, you can check it out. Ｗe had hamburgers for our lunch. 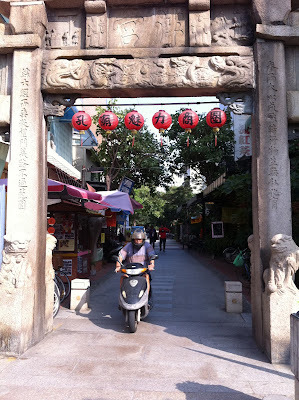 The restaurant was in this small alley which was located at the cross street of the Confucius Temple. 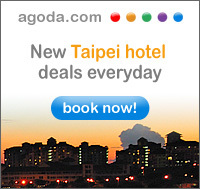 Actually, Tainan is very famous for its traditional food. There are a lot of famous food vendors. If you ask any Taiwanese about Tainan, the first answer will be food. That is no doubt in my mind. This is the latest established national park in Taiwan. It is very different than other national parks. It doesn't have massive marbles, cliffs, or sea shell beaches. It has vast mangrove swamps which offers a perfect environment for the marine lives and attracts many migrant birds each year. According to the record, the highest record of different birds appeared in this area was around 200 spices. 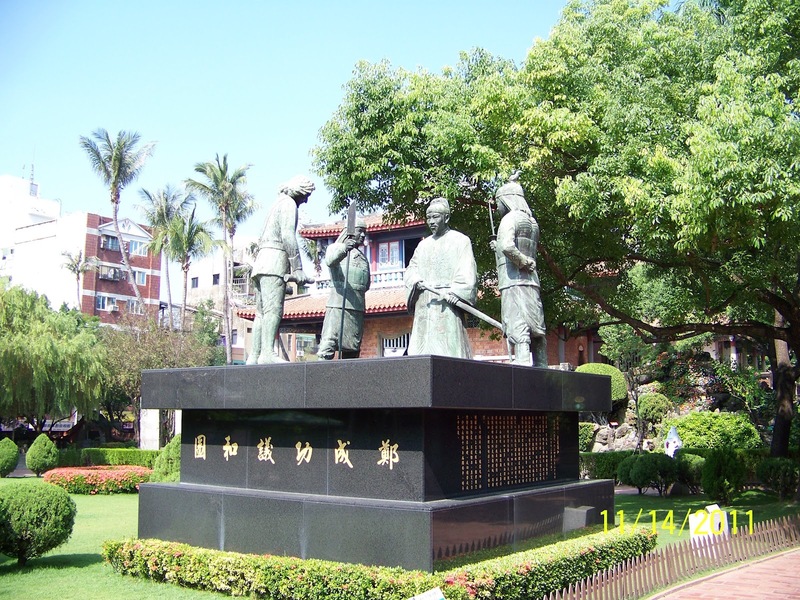 Not only its richest ecology but also its history has influenced Taiwan's society in many different aspects . They came out for a sun bath. This is an old fishing technique. The fisherman will sleep inside the metal canopy to scare away the intruders birds or thefts. After the boat ride, we visited Anping which was the Dutch landing place and the oldest district in Taiwan. The Dutch built Fort Zeelandia now called Anping Fort in 1634; however, the Fort had been tore down to build the Eternal Golden Castle in 1874 for defending Taiwan against Japanese. Today, the only remains are small areas of walls. Furthermore, the Dutch also constructed the first street in Anping which now became a famous old street with traditional food and attracted a lot of visitors during weekends and holidays. The first floor of the Old Tait & Co. 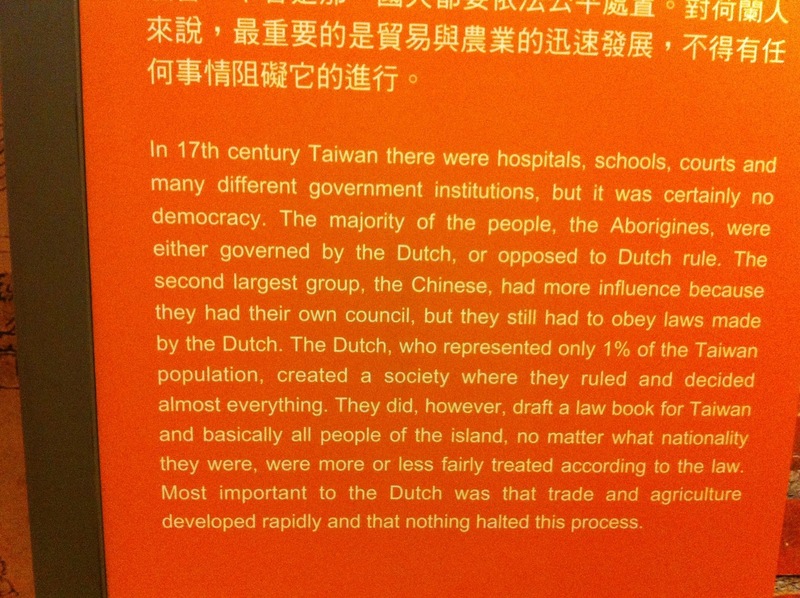 Merchant House displays many information about the lifestyles and political issues during the Dutch ruling Tainan. 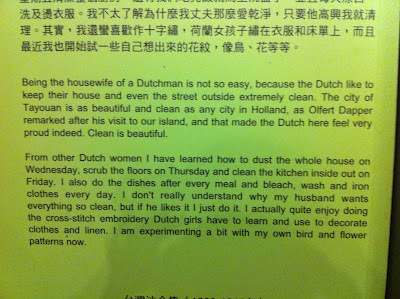 This was a aborigine's woman who marred to a Dutch man described her marriage life in a different culture. It was interesting to read and reveal their life at that time. 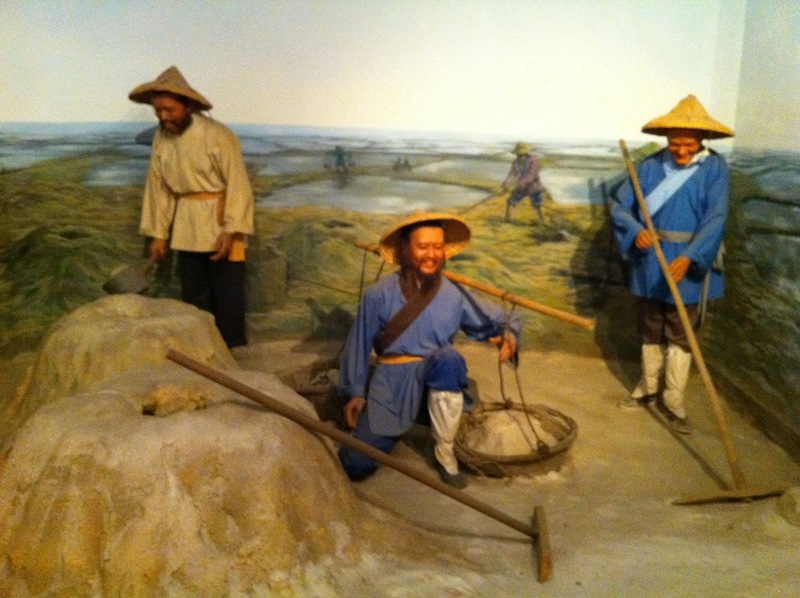 The second floor displays several different themes about the lifestyle of the Chinese immigrants. Behind the merchant house is the tree house which was the warehouse. The overgrowing banyan tree's roots penetrated into the voids in the walls and became parts of the warehouse structures. They both became parts of each other. The lookout tower is behind the tree house. We could see the mangrove swamps where we had taken our boat riding route early. We also visited the Anping oldest street for supper there and also shopped at some souvenir stores. It was fun to walk around there.